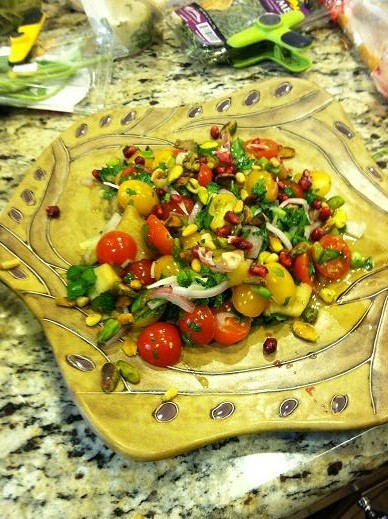 This salad is also known as baba ghanouj. Its classic flavors of sweet and sour, so characteristic of middle eastern food - fresh, bright, and refreshing. Easy to make; I’ve made this one three times already. Can be used as a salsa as well as a salad. Pierce the eggplants all over with a fork and place them on a charcoal or gas grill over medium heat, or broil in the oven. Keep turning them evenly to char the skin. It will blacken and begin to collapse after 25 – 30 minutes. Remove and place in a colander or on a rack to drain some of the juices. When cool enough, slice in half lengthwise. Peel away the charred skin and place in a colander to drain further. Chop the eggplant into small chunks and place in a bowl. Add the green onions, shallot, garlic, lemon juice and salt. Lastly, add the tomatoes and toss gently, taking care not to mash the eggplant. Sprinkle on the parsley and mint. Spoon into small serving plates, then scatter the walnuts on the top, garnish with the pomegranate seeds and drizzle a little pomegranate molasses on top. Drizzle on the olive oil, and serve immediately.